A Silicon Valley startup has designed an innovative new monorail system of robots for tilting solar panels toward the sun, increasing the amount of electricity produced by up to 15 percent and changing the game for the future management of solar-energy systems. People already can use motor-powered trackers to tilt solar panels toward the sun as it moves throughout the day to optimize energy output. However, these systems are often complex and expensive to install and maintain. The QBotix Tracking System (QTS) by Menlo Park, Calif.-based QBotix, however, is the first comprehensive and intelligent system to use robots to automate this task, reducing the amount of energy it takes to tilt the panels while optimizing energy production, according to the company. QTS also includes intelligent sensors that collect data on the health of the system and transmit data about the system’s energy production, health, and other information back to the owner of the panels for real-time monitoring. 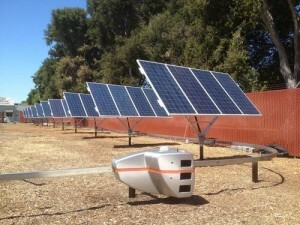 QBotix — founded by a team of solar industry and robotics experts from Silicon Valley, MIT, Caltech, and Stanford — so far has secured $7.4 million in venture capital funding for its solar-panel robotics system, generating significant buzz for its innovation and potential ability to revolutionize the solar-power industry. “QBotix Tracking System is a game changer in the area of solar balance-of-systems,” said Peter Shannon, managing director of the Firelake Capital Management — one of QBotix’s VC backers — in a press release. “There is no system that provides such a dramatic value proposition in the market.” The primary reason for Shannon and the solar power industry’s enthusiasm for the system is its intelligent and efficient design, allowing QTS to work at a lower cost with more accurate positioning capability than existing motor-powered trackers. Typical trackers can either be single-axis or dual-axis, with the latter a more expensive option because it makes more precise adjustments for the movements of the sun and thus requires more motors for power. QTS also leverages dual-axis tracking, with two autonomous battery-driven robots — one serving as primary controller and one as back-up — to manage 300 kilowatts of solar panels, moving them once every 40 minutes. Those panels are installed on mounting systems designed by the company and don’t need their own individual motors, traveling on a monorail to adjust the mounting system for optimal solar positioning, according to QBotix. The result is a robotic-powered tracking system that requires up to 20 percent less electricity to run while increasing the output of the panels by up to 15 percent. The system also is compatible with all standard solar modules, inverters, and foundation types used in ground-mounted installations, making it versatile and practical, according to QBotix. QTS has already been successfully deployed in a testing environment and will soon be used in its first commercial deployment in San Francisco, according to the company.